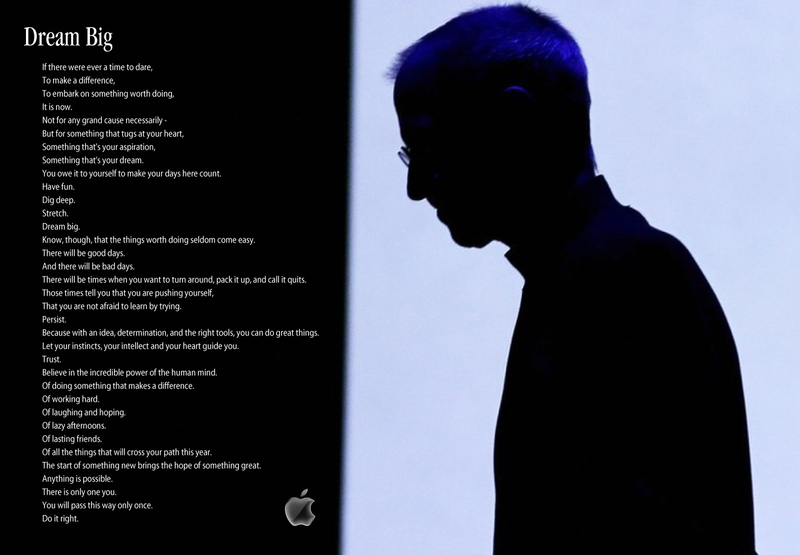 Steve Jobs was a dreamer… and a visionary. The kind of person we all could look up to and admire. The kind of person that we would all like to be– if we had that kind of drive. Thing is, instead of just dreaming, Steve Jobs did what he dreamed about doing. If he had an idea, he went for it. If he wanted to change the way people thought about things, he tried it. He didn’t always succeed. But for every failure, there is the possibility for a success. Steve Jobs never let his failures get in the way of his success. The text used in the above image comes from an Apple Computer ad from the early 1990s. I couldn’t find the original ad anywhere online, so I re-created a new version of it using an image of Steve Jobs and the Apple Logo. I hope I don’t get sued. The story below was posted to my blog on October 22, 2005. 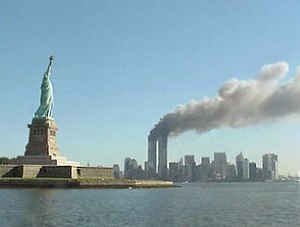 Re-Launch: September 11: Where Where You? This was originally posted on September 11, 2004. I’ve made a few edits to bring things into today’s situation, added a final thought. I was getting ready for work. It was just another Tuesday morning. I was dating my ex at the time, and he had already left for work, so I was going about my usual routine. I showered, got dressed, and had some breakfast. Everything about that morning was par for the course. Except that I turned the TV on. You see, I was and still am not a TV-in-the-morning type of person. I rarely ever catch the Today show or Good Morning America, unless I’m home sick or on vacation, and even then it’s rare. So my turning on the TV while getting ready for work that morning was very random. I turned on Good Morning America. Diane Sawyer was talking to some family about some wonderful thing that had happened and they were all smiles, feeling happy and good about whatever it was they were talking about. I don’t remember. I just remember thinking “Typical morning-show sappy stuff,” and kept going about my business. They broke for commercial, showed one commercial, and then came back, abruptly. There were Diane and Charles Gibson, sitting in another room. They looked very serious. And they showed the tower. Ablaze. A huge gash cut out of it. My mouth dropped. I couldn’t believe what I was seeing. It was approximately 8:50AM, Central time. The first plane had hit at about 8:45AM. As I watched in amazement, the commentators tried to describe what had been happening up until then. It was believed that it was a plane, but nobody was sure how big of a plane it had been. As far as anyone knew, there was no footage of it, and it had happened so fast that not many people saw it. But now our eyes were glued. Our attention was focused. And at three minutes after 9:00, our lives changed forever. I watched the second plane fly into the second tower. In real time. As it happened. I never felt such fear in my entire life. For some reason, I knew right away that we were under attack. I knew that nobody at that moment was safe. If whoever did this could plan it so that two separate planes could fly into the two towers of the World Trade Center on the same day, just minutes between each other, then they were capable of anything. “Oh my GOD… Oh my GOD…” said the voices on TV. I called my roommate in to see what was going on. He was supposed to be flying to New York that week. “Uh… I don’t think you’re going to New York,” I told him. Oddly enough, the first name that popped into my mind was Osama bin Laden. Just weeks before this, reports had been coming out of Afghanistan about centuries-old relics being destroyed by bin Laden’s Taliban regime. They were denouncing all capitalist countries, especially America. They were predicting jihad on America. I watched intently, thinking that this could get really ugly. bin Laden’s name was familiar, also, because he was named as the person of blame in the 1993 World Trade Center bombing. I didn’t know quite what to do at that point. I called my ex, who was on a train heading downtown, and told him what was going on. He said that people had been getting phone calls left and right but he couldn’t figure out what was going on. I told him I was going in to work. I didn’t know what else to do. It was an absolutely gorgeous day outside. The air was cool, and the sun was warm. Fall had not quite set in on the region yet. It was a beautiful late summer day. The train ride to work was even worse. People who knew each other were talking extremely softly to each other. Some were on their cell phones. Others just stared out the window. I was like a funeral. I realized that I wasn’t the only one who felt the way I did. What do you do in this situation? What do you say? I got off the train and walked the rest of the way to work. Over to the north is the Hancock Building. To the east, the AON Tower. To the south, Sears Tower. I watched the skies feverishly, hoping to God that nothing was coming. I paid special observation to the AON Tower, and noticed how much it reminded me of the World Trade Center. I started to cry. I got to work and started my ascent, 38 floors up. Silence in the elevator. I told them that I had watched it happen on TV. A couple ladies were a bit hysterical. “This will not work. We won’t be here long,” I thought. Sure enough, at 10:30 the announcement came that we were to go home. I grabbed my things and got out, fast. The train ride back was even more morose than the ride in. People seemed stunned into silence. When the train came out of the subway, I remember glancing back toward downtown in case of any further activity. Before I knew it, I was home again. My ex and I watched TV from the time I got home until 2 in the morning. I saw the towers fall so many times that I could see it with my eyes closed. I saw the Pentagon, the military center of the United States, in flames and rubble. I saw the aftermath of the plane that went down in Pennsylvania, and wondered which target it was truly heading for. I repeatedly saw the video of people running as fast as they could after the enormous plumes of dust and paper and glass racing behind them. And I saw the war-zone-like aftermath, with bloodied, dirtied, and barely alive people, wandering aimlessly as they try to figure out for themselves how they got there–how this happened to them and to their city. I saw the streets lined and littered with destroyed fire trucks and automobiles; glass blown out of buildings still standing, trees and traffic lights, bent and broken and twisted, and papers.. the papers… everywhere you looked were papers. September 11, 2001 was just like any other day when it started. September 11, 2001 was a day that I will never forget for the rest of my life by the time it ended. Every year on the anniversary of the attacks, I relive these moments. As I read through them just now, I remember every moment of that day as if it happened just hours ago. At this very moment, it’s 11:44am. Ten years ago at this very moment, I was probably walking back to my apartment from the train station. I remember, as I mentioned in the initial article, how still and peaceful the day was. I remember thinking that maybe it was because there were no planes flying overhead. All air travel was suspended that day. So between the glorious, warm sunshine and the cool breezes, it felt otherworldly to be outdoors that day. “Never forget,” we say every year at this time. I never forget, anytime. It’s hard not to remember. I didn’t lose anyone close to me that day. In fact, I don’t know anyone who perished that day at all. But everyone lost something that day. And in some ways, we still haven’t found it again. I don’t know that we ever will. I Love New York – 33-29! 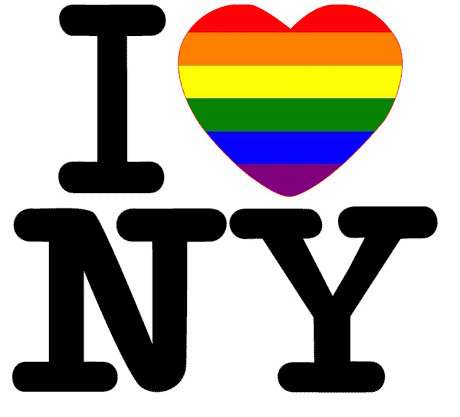 Tonight, the New York State Senate passed the bill allowing full GAY MARRIAGE in the state. This is incredibly significant for equal civil rights, because the precedence set by this passage could pave the way for other states to pass the same legislation. The bill was passed with provisions protecting religious organizations if they wished to not allow gay marriage, or to refuse couples from using their buildings and/or halls for such celebrations. These provisions absolutely MAKE SENSE, because they are perfectly within their right to disallow such things under the proclivity of religious freedom. The provisions greatly helped the bill to pass, and the bill passed with bi-partisan support. It hit me earlier today that this historic vote falls as the anniversary of the Stonewall Inn riots of 1969 approaches. That this event is taking place now, on the eve of that anniversary, in the same state where it occurred, is incredibly moving. I created the above image just as the vote was taking place. The moment it passed, it became my Facebook profile picture, and within minutes, many of my other friends started to use it as their picture. Feel free to pass it around. And proclaim your love for New York loud and proud! 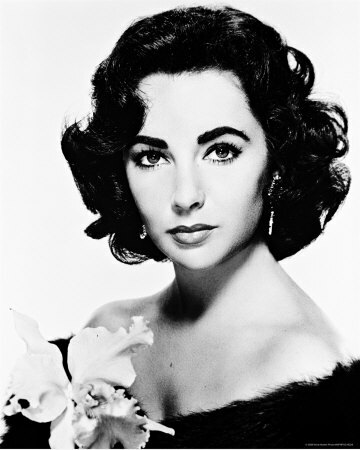 The divinely lovely Elizabeth Taylor died today at age 79. She was lovely in more ways than just the physical, however. She was a fierce advocate for numerous charitable organizations for HIV/AIDS research, the LGBT community, animal rights, and creative freedoms. As notorious for her seven marriages as she was for her beauty, Liz never let the tabloids get the best of her. She was quick to rebuke a story that wasn’t true, and did so with fierce voracity. She played the spitfire in many a movie– and it was pretty obvious that she didn’t have to act all that much to play those roles. She was a force to be reckoned with. She was truly remarkable —generous in spirit and heart, especially through her work in helping to create amfAR (American Foundation for AIDS Research) and the Elizabeth Taylor AIDS Foundation when others couldn’t even be bothered to utter the acronyms HIV or AIDS. For these and all of her other talents, she will never be forgotten. As further proof that Elizabeth Taylor was one-of-a-kind, the Grand Dame had a Twitter account (which was verified) that she used from March 31, 2009 until her last Tweet on February 9, 2011. And in true Liz form, she didn’t just use it to share her day-to-day events—she used it to share her innermost thoughts on topics such as the death of Michael Jackson, refuting stories about her in the tabloids, and, probably most frequently, living life to its fullest. 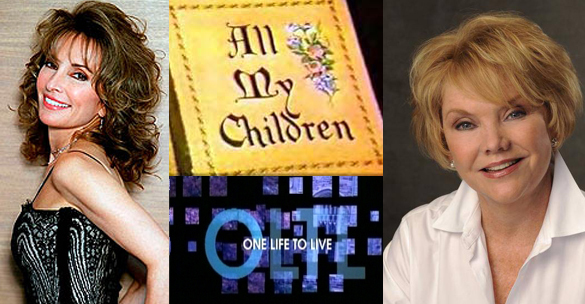 In one of the last series of Tweets to this account (@DameElizabeth) on July 22, 2010, Liz shares her philosophy on living life, and giving generously to others. Reading this now, it’s almost as if she was saying farewell to her fans, and giving a last bit of advice. Hold your horses world. I’ve been hearing all kinds of rumours about someone being cast to play me in a film about Richard and myself. No one is going to play Elizabeth Taylor, but Elizabeth Taylor herself. Not at least until I’m dead, and at the moment I’m having too much fun being alive…and I plan on staying that way. Happiness to all. I would like to add something to my earlier tweet. Always keep love and humility in your heart. Never let yourself think beyond your means…mental, emotional or any otherwise. You are who you are. All you can do in this world is help others to be who they are and better themselves and those around them. Give. Remember always to give. That is the thing that will make you grow. That is the thing that will give back to you all the rewards that there are. Don’t do it for yourself, because then it becomes selfish. Because then it becomes about yourself…which is wrong. Giving is to give to God. Helping is to help others. Every breath you take today should be with someone else in mind. I love you.